Aaron and Stefanie in a congressional office, with staffer, during Headache on the Hill. Aaron Wiseman carries injectable sumatriptan with him at all times. He never knows when a cluster headache might strike. And when it does, it hits with such force that he has to immediately take his medication to try to stop the pain. To demonstrate his essential need for this medication — and discuss how the drug doesn’t prevent headaches, nor does it always work to dull the pain — he pulled it from his pocket and showed the injector to staffers during the patient advocacy day Headache on the Hill (HoH), run by the Alliance for Headache Disorders Advocacy. The day of meetings with senators and representatives in Washington, D.C., gives headache patients like Aaron the chance to be heard by government officials who can fund real change in health care legislation. Aaron took part in Headache on the Hill in 2017 with his wife, Stefanie Garcia, his caregiver during his cluster headache episodes, and his partner in all things. She too does advocacy work around eating disorders, which she has experienced. Here, they discuss why they took part and why patient advocacy matters. HealthCentral (HC): Aaron, can tell us about your first cluster headache episode – or, if you can’t remember, your most challenging experience with the disorder? Aaron: My clusters started when I was so young that I honestly can't remember the first episode. Sadly, I have a number of vivid memories from cluster attacks over the years. I suffered a severe attack the night before our honeymoon and ended up in the ER. We literally brought our luggage to the ER so we could head to the airport the moment I was discharged. We made our flight and were even given a complimentary upgrade to first class because the airline felt like being romantic. They gave us champagne and we got to stretch out and I remember absolutely none of it because the only way I could stand through the pain was to be doped to the gills with drugs. Not the best. 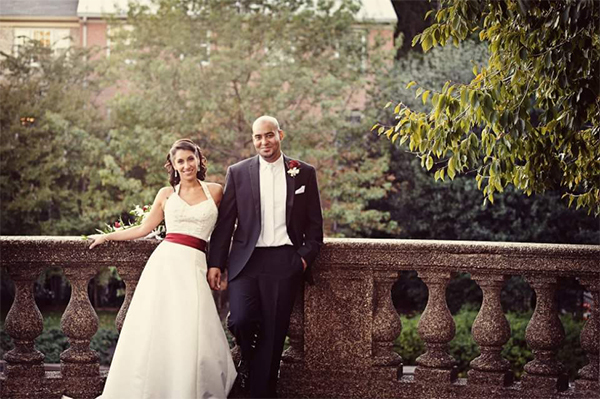 Stefanie and Aaron got married in 2012 in Northern Virginia. HC: Aaron and Stefanie, why did you take part in Headache on the Hill? Aaron: Having a disorder like cluster headaches can be tremendously isolating and demoralizing. Taking part in HoH allowed me to connect with other people and regain some confidence. Stefanie: Cluster headaches affect 0.1 percent of the population. They’re virtually unknown to anyone who is not directly affected by them — even to most medical professionals! Bringing awareness to this condition is crucial to increasing research and treatment options. The more that people understand about clusters, the more options we can have for our loved ones. Being able to educate those on the Hill was immensely satisfying and, I hope, productive. 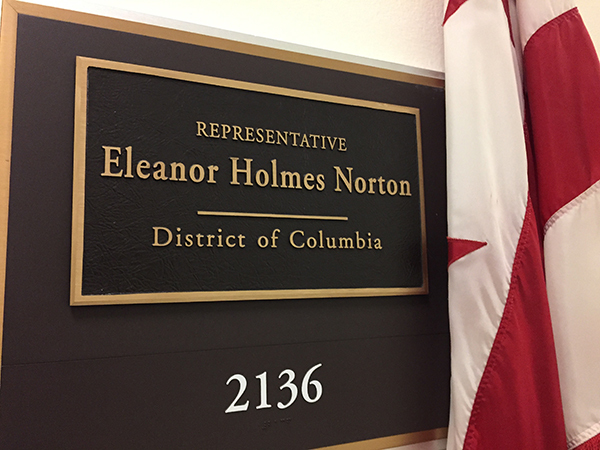 They visited the offices of Eleanor Holmes Norton during HoH, who represents their Congressional district. HC: Stefanie, as Aaron’s caretaker during his cluster headache episodes, what does patient advocacy and awareness for this disorder mean to you? Stefanie: Being a patient advocate is one of the greatest but hardest things I’ve ever done. When Aaron is in the middle of a cluster, I am literally his voice. I speak for him to the doctors and nurses when he can’t answer questions. I fight for him when they won’t listen, when they refuse the treatment we request, when they scoff and think “it’s just a headache, take some Tylenol.” Often, I know more about his condition than the professionals at the hospital, and they still don’t believe me. So, for me personally, advocacy isn’t just about posting on Facebook or attending events. It’s asking for oxygen at the hospital. It’s battling with the insurance company about access to medication. It’s everyday life. And the more formal side of patient advocacy that I participate in — social media, lobbying, conferences — can generate the awareness that’s needed to change our everyday life. Mr. and Mrs. 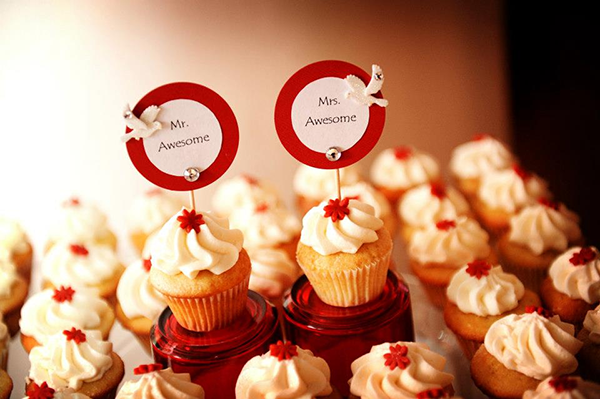 Awesome cupcakes at their wedding. Aaron gave himself and Stefanie this nickname. HC: Aaron, as a young man with cluster headaches, how does advocacy fit into your daily life? Aaron: Most people have no idea I suffer from a pain disorder. For years I preferred it that way. I felt like giving voice to my disorder meant giving it more power. Eventually, I realized that I was doing the opposite. By suffering in silence, I allowed my disorder to control who I was and how I live my life. I decided my role as an advocate is to humanize my disease by speaking about it regularly and openly. I refuse to disclose my disease to friends with a whisper. Or discuss my various treatments using hushed tones. My daily advocacy is my refusal to be silent. HC: How would you recommend others take part in practicing advocacy for their chronic condition despite having busy lives? Aaron: Talk about your condition with anyone that will listen. People are naturally curious, so they want to hear about new things. Tell others about your struggles and needs in casual conversation. If you've had a bad day, it’s OK to admit that to people. Tell people about HoH and encourage others with chronic pain symptoms to seek medical help. One of my biggest regrets is that I battled my disease for years before seeing a neurologist. I just didn't talk about my pain because people just don't do that. If I had, and if others do the same, people may get better treatment sooner. Stefanie: As I mentioned before, advocacy can take many different forms, and everyone should do what’s comfortable for them. But the more we can get the word out, the more we can help those suffering from cluster headaches. Post on Facebook, Instagram, Snapchat. Attend advocacy days on the Hill, conferences, headache/migraine-specific events. Be open about your condition with friends and family, if you can. And most importantly, take care of yourself and reach out for help when you need it! Be gentle with yourself and know that you are not alone.